The first game of the post-DeMarco Murray era was a win for the Cowboys, but the new running back combo of Joseph Randle and Darren McFadden didn’t exactly light the stat sheet up. The duo combined for 81 yards on 22 carries in Sunday night’s 27-26 victory over the Giants. Randle provided the lion’s share of that production with 65 yards on 16 carries, and McFadden added 16 yards on six carries. But the rushing stats don’t tell the whole story of the running backs on Sunday night. They also made a pretty significant impact in the passing game. Lance Dunbar actually led the Cowboys in receiving with 70 yards on eight catches--including a couple of key receptions on the final drive of the game. 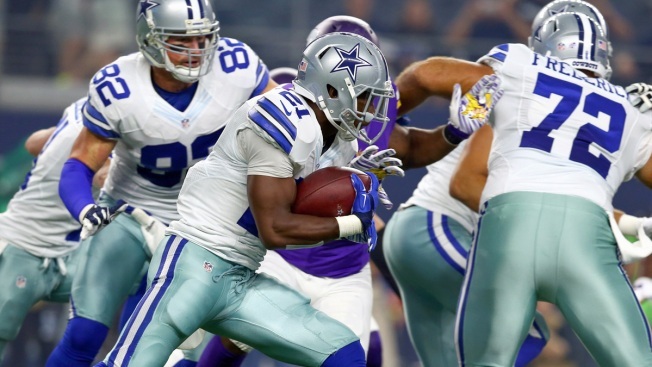 Randle had 42 yards on three catches, and McFadden had a catch for 19 yards. That’s a total of 131 receiving yards coming out of the backfield, a number that we’d imagine makes offensive coordinator Scott Linehan smile.